We liked nearly everything about our HostRocket web hosting experience. Highlights include: an A+ BBB rating; renewal pricing clearly indicated in the shopping cart; quick and easy checkout; as well as easy set up and maintenance using the cPanel control panel with Softaculous apps installer. 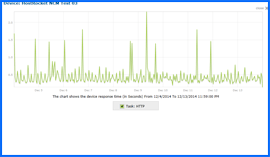 Further, testing indicated that HostRocket servers are both fast reliable. We did find a few minor things we didn’t like, including a 9-hour delay between receipt of the “Welcome” and “Account Information” e-mails; and the money-back guarantee details being hidden away in the Support Knowledgebase. On balance, HostRocket has earned the NCM Online designation of RECOMMENDED. HostRocket offers a single low-cost shared web hosting plan. The monthly cost ranges from $5.99 per month for biennial billing, all the way up to $11.98 per month for monthly billing. Cost-conscious shoppers should note that the annual billing plan provides 3 months free; while the biennial billing plan includes 6 months free. Conversely, monthly and semi-annual billing cycles incur a one-time, $29.99 setup fee. Shared hosting features include the cPanel control panel, the Softaculous applications installer (with more than 250 included apps), unlimited disk space, unlimited bandwidth, unlimited websites, unlimited e-mail accounts, unlimited FTP accounts, unlimited sub-domains and unlimited MySQL databases. In addition to unlimited POP3 or iMAP accounts, e-mail features include web-mail access; integrated spam filtering; as well as unlimited autoresponders, forwards, aliases, and mailing lists. Additional shared hosting features include RVSiteBuilder, free control panel site backups, streaming audio/video capabilities, free Perl module installations, URL redirection, web-based file manager, custom error pages, server side includes, hotlink protection, and phpMyAdmin. Software support includes PHP 5 with suPHP, MySQL 5, Perl 5, SSH access, CRON abilities, Microsoft Expression, GD/ImageMagick, AwStats and Webalizer web statistics. 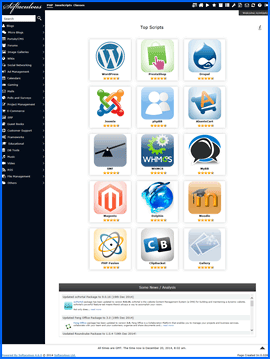 HostRocket cPanel control panel screenshot. Click to enlarge. Additionally, the easy-to-use Softaculous “1-click” script installer provides more than 250 popular applications and tools, including WordPress, PrestaShop, Drupal, Joomla, phpBB, AbanteCart, SMF, WHMCS, MyBB, Magento, Dolphin, Moodle, PHP-Fusion, ClipBucket, Gallery and many more. HostRocket’s services are highly scalable. The shared plan offers a dedicated IP address option for only $2.00 per month, and an SSL certificate option at only $99.00 for two years. 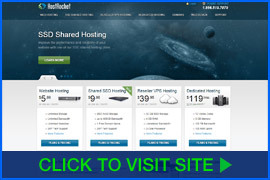 In addition to cheap shared hosting, HostRocket offers a range of speed-enhancing SSD (solid-state drive) shared hosting plans, reseller VPS hosting plans, and dedicated hosting plans. All HostRocket shared plans are backed by a 99.5% uptime guarantee and a 30-day money-back guarantee. While details of the uptime guarantee can be found within the Terms of Service, we took exception to the fact that money-back guarantee details are available only via the Support Knowledgebase. As we would only require a few months of hosting so that we could test and review HostRocket, we selected the $11.98 monthly billing cycle (subject to the $29.99 setup fee), and proceeded to checkout. Although it includes four steps, the HostRocket checkout process is quick, easy, and unlike all too many cheap hosting services, consumer-friendly. Step 1 requires entering the domain name to be associated with the account. We entered our domain and pressed the “Click to Continue” button. Step 2 requires the selection of a billing cycle. We selected the monthly billing plan and clicked the “Update Cart” button. Step 3 provides an opportunity to review and edit the previous selections. The current amount due as well as the recurring amount and billing cycle are clearly displayed. We clicked the “Checkout” button. HostRocket Softaculous “1-click” applications installer screenshot. Click to enlarge. Step 4 requires entry of account billing information, password selection, and credit card (Visa, MasterCard or American Express) information. We were disappointed to see that no PayPal payment option was available. After agreeing to the Terms of Service, we clicked the “Complete Order” button. Within one minute of completing our order we received no less than 4 HostRocket e-mails: “Welcome,” “Order Confirmation,” “Customer Invoice,” and “Credit Card Payment Confirmation.” While the “Welcome” e-mail did include the account login information (and a somewhat indirect route to the cPanel), it did not include all of the information required to set up our test site quickly. That e-mail would arrive 9 hours and 1 minute later. With a subject line of “HostRocket Account Information,” it included the direct control panel login information, server information, nameservers, complete FTP information, backup information, and e-mail settings. While we have previously experienced delays in receiving complete account information e-mails, those hosts manually review new orders before accounts are created. As the very first e-mail received (“Welcome”) included account login information, it was obvious that new accounts are automatically created, and therefore a bit odd that it would require an additional nine hours to forward the balance of the account information. 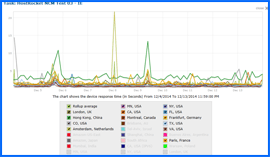 HostRocket Uptime Test Results Chart. Click to enlarge. Using the information provided in the “Account Information” e-mail, we set up our test site as well as our Dotcom Monitor uptime and page load speed testing, and then waited for test data to accumulate. All web hosting services reviewed by NCM Online are purchased and subjected to our 10-day test for uptime and speed. Tested for uptime every 15 minutes over 10 days, HostRocket produced a perfect 100% reliability score (see Uptime Test Results Chart right). Further, HostRocket recorded an impressive average speed of 1.3018 seconds to load our test site from 13 locations worldwide, and only 0.9654 seconds from 7 U.S. locations (see page load speed test results chart below right). After reviewing the test results, it became clear that HostRocket would rank amongst our top-10 shared web hosting services. HostRocket Speed Test Results Chart. Click to enlarge. With a few minor exceptions, our HostRocket experience was extremely positive. Whether you are new to web hosting or an experienced web professional, HostRocket will meet or exceed your expectations and is worthy of your consideration when selecting your next shared hosting provider. HostRocket has earned 4.5 stars and is recommended by NCM Online. Cheap website hosting company price comparisons based on 1-year term list price before coupon/promo codes or limited time/introductory offer discounts. These are the renewal rates for the second year of hosting. To ensure that you receive the most affordable HostRocket pricing possible, please visit our Web Hosting Coupon Codes page for current discounts and special offers before making any purchases. HostRocket is a web hosting and related services company. The company provides SSD (Solid State Drive) Shared Hosting, Reseller VPS Hosting, Dedicated Hosting, Domain Search and Transfer, Web Design and Support Services including Account Management. SSD Premium for $9.98 per month. SSD Professional for $13.98 per month. Shared Hosting plans are capable of hosting multiple websites using ”add-on domains.” These are sub-directories under one main account with DNS maps. However, hosting multiple websites on a shared plan has some limitations. Each account is allocated a specific amount of resources including CPU, memory, I/O. As more websites are added to the account, they compete for the limited resources which can affect their overall performance. If you need to host multiple websites, a reseller VPS hosting plan or a dedicated plan from HostRocket is a better choice. Reseller VPS Hosting by HostRocket shares some features with shared hosting, the major difference being that a reseller VPS plan gives you a dashboard from which to manage your account. With a reseller VPS account, you can create multiple ”shared-style” hosting plans and manage them from the dashboard. As you add more websites, you can create a cPanel account for each website using its own unique username and password, email account, and, most importantly, its own separate resources. A cPanel that allows you to upload and manage your web pages, install your applications and backup your data. A WebHost Manager (WHM) that allows you to setup and modify your customer accounts, create and apply hosting plans as well as integrate new web technologies. Reseller VPS plans by HostRocket are great for web designers, development companies and businesses that need to host multiple websites. Dedicated Hosting by HostRocket is the gold standard when it comes to server hosting. Dedicated hosting offers you all the resources and capabilities of an entire server without having to share with anyone. A dedicated hosting plan can handle vast amounts of traffic and just about any kind of multimedia and interactions, thus making it a good choice for businesses that need to give customers a superior user experience for their customers. All the dedicated plans by HostRocket are billed on annual cycle. This video tutorial demonstrates the installation of WordPress on a HostRocket shared hosting account using cPanel and the Softaculous 1-click applications installer.